Rev. Koning (right) receives award from Natalie Knapp (center) and Jon Terry (left) of the Au Sable Institute. Rev. 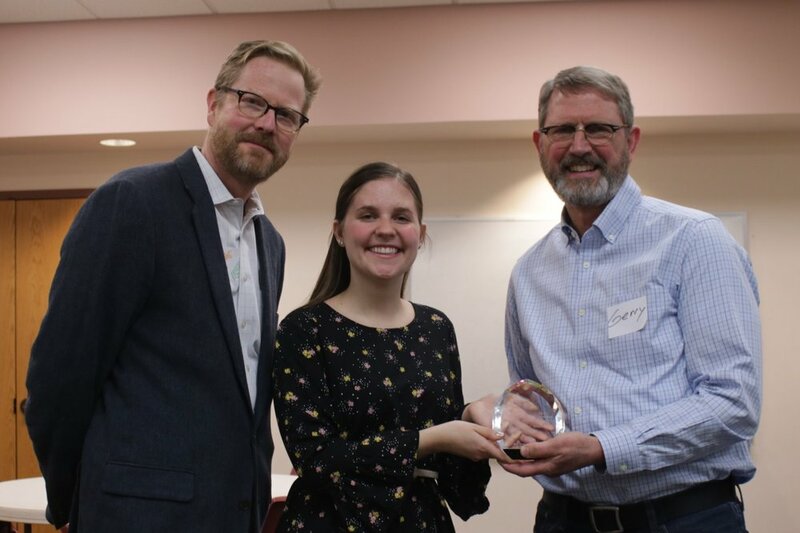 Gerry Koning is the 2019 recipient of the Creation Care Pastoral Leadership Award, a recognition given by the Au Sable Institute to a church leader who is committed to serving, protecting and restoring God’s earth. The award was presented to Rev. Koning at a reception held in Grand Rapids, MI, on March 28, 2019. Photos of the event are found below. It is my honor this evening to present Rev. Gerry Koning with the Creation Care Pastoral Leadership Award. This is a new award and one that will be given annually to a church leader who shows an active commitment to the biblical mandate of caring for God’s creation. We are hopeful that the award will inspire other church leaders to give this issue the attention it deserves. Rev. Koning is pastor of Trinity Christian Reformed Church in Grandville, MI. Earlier this year, he preached a sermon series on the sanctity of life, which is a familiar topic to many Christians. What was unique about this series was that it began with a sermon focused on caring for God’s creation. Rev. Koning’s sermon, titled “The Perfect Place”, highlights the beauty and uniqueness of our planet, and how our care for the earth impacts the rest of God’s creation, including plants, animals, and other humans. In addition to preaching about the need to care for creation, Rev. Koning and his church are active caretakers of God’s earth. Trinity CRC has a Stream Team that adopted a stretch of Rush Creek that runs near their church and works with other churches to take steps to protect the creek. Trinity CRC is the first church to become a grantee of the Michigan Clean Water Corps program and is now responsible for collecting and reporting data on their local watershed.